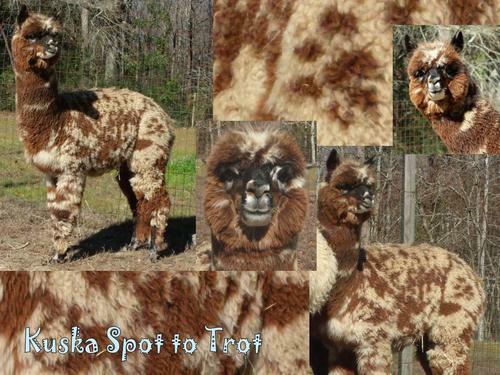 Mother of Kuska Spot To Trot and rebred to same male..... Need I say more? At first we thought she was a lovely fawn. However after shearing many new developments, 1 she has a nice 2 inch round rose grey spot on her bum, and as her fiber has returned we believe she is a light rose. 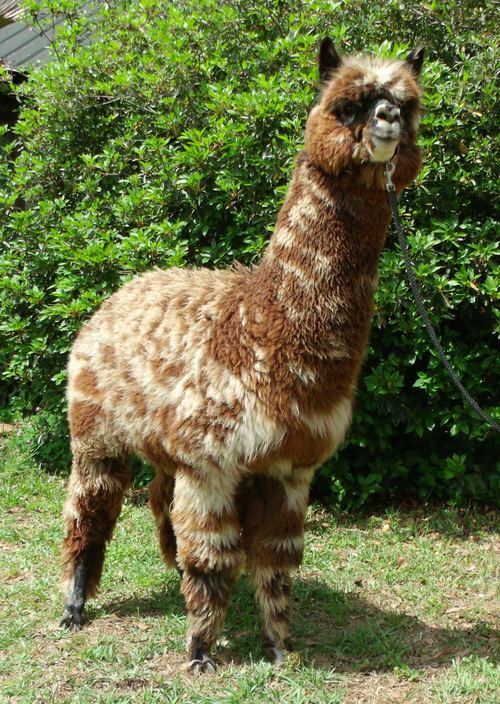 Giggles coloring will be interesting to watch, but even more interesting to breed to. 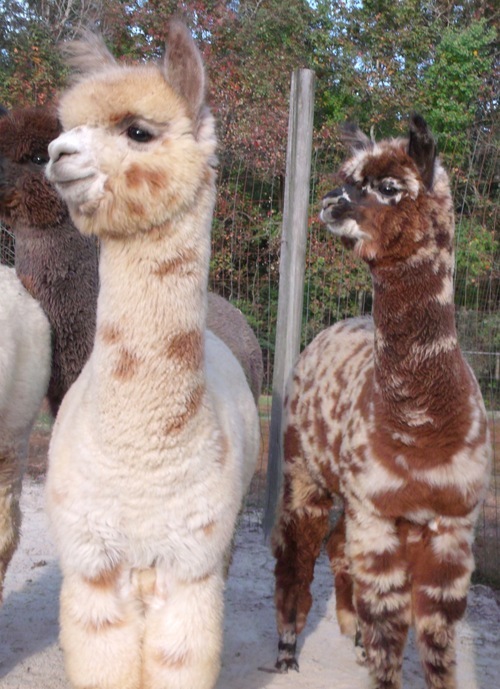 She has dark pigment around both eyes (like eye liner - a trait Yana passes to all of his cria), dark ears and a nice dark noes. She is 7/8th Peruvian with just a little Chilean color thrown in. Her pedigree features some fantastic lines from Accoyo Felix, Accoyo Finito , & Peruvian El Cid. Her fiber is returning in the dense tight conformation we see in all of Yana's babies. This combo with Helga is just super and something we plan to repeat! CAN YOU SAY CRIMP? Giggles can! Plus add in her super long staple length, extreme density, & then that high frequency consistent crimp that Yana produces so easily! 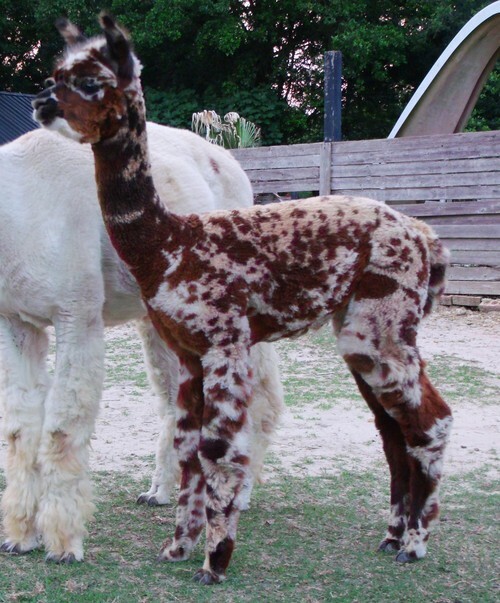 She gave us a very rare and beautiful maroon and fawn appaloosa from Apsolut in 2014, (Spot To Trot) with another outstanding harlequin in 2016 and yet another in 2017! bred for another outstanding appy in 2018! One of our top quality foundation appaloosa producers, she is bred for appy again in 2018.. She will remain here making us more appies unless the price is right! We have been waiting for this one..
Haya's Full Peruvian Harlequin Grey son, and out of one of our finest females.. 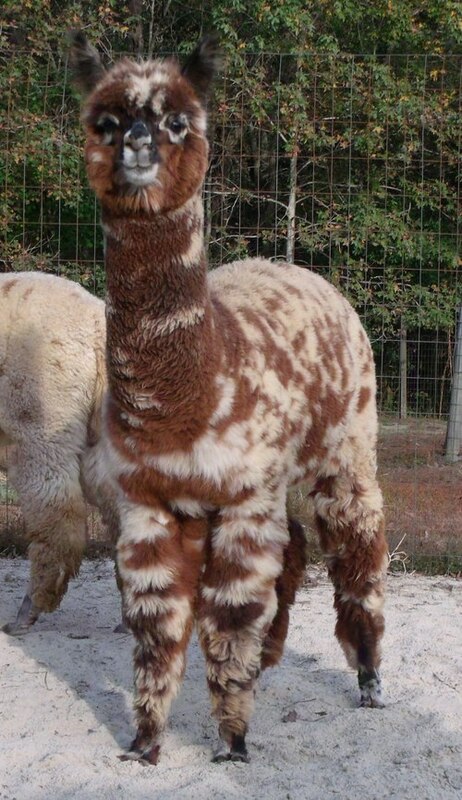 He features Accoyo Royal Fawn & Accoyo Pluro plus all of his daddy's color..
and yes, That fleece underneath is as grey as it can be.. check back after shearing for color changing Domino! Always planning for the future.. We know Domino will continue to bring Haya's extreme color to our program for many many years. She is all that and more. Arriving Easter weekend, all I could say was Yes Yes Yes, exactly what we were breeding for. She is a Striking Maroon, Fawn, Grey, Black Appaloosa..
YOU NAME IT SHE HAS THAT COLOR SOMEWHERE ON HER!! .. Spot is something special.. 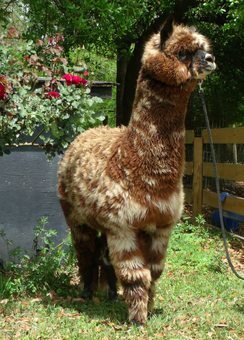 Awesome bloodlines and color from Accoyo Felix, Peruvian Bueno, Accoyo Finito, Peruvian El Cid, Peruvian Black Magic, Black Epic.. Lionel and much more!! She sports EXCELLENT BONE SIZE AND SUPER STRAIGHT CONFORMATION. She has a sweet demeanor that is pleasant to be around. We are thrilled to see this maiden flourish we expect her to be breeding by fall of 2015. We have selected spot to remain as a foundation female for our farm at this time.